This recipe has been adapted from a Maharashtrian non vegetarian cookbook authored by Aditya Mehendale titled “Rare Gems: A Non veg gourmet collection from Maharashtra”. True to its title this book features hundreds of recipes from every nook and corner of Maharashtra- some that are widely known, others less acclaimed but prepared often in a Maharashtrian household. Tondak- is a Goan Konkani vegetarian dish prepared traditionally with legumes like red cow pea. 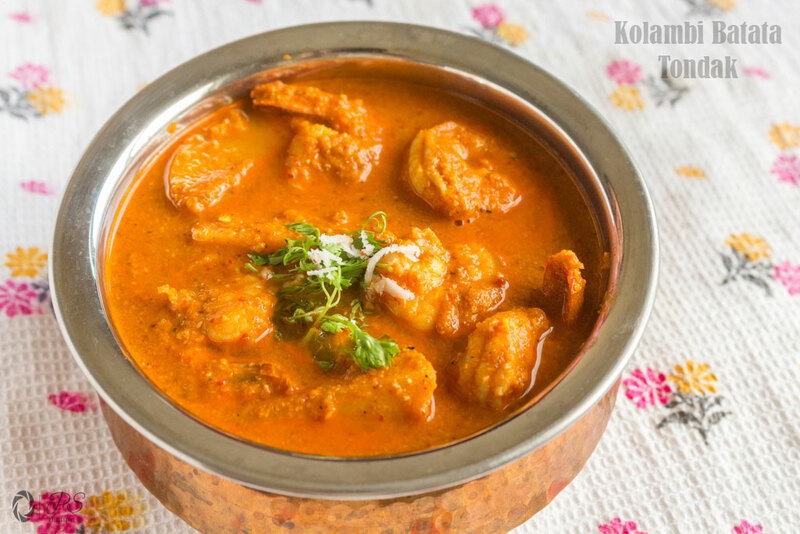 It is a thick gravy preparation that makes use of generous quantity of fresh coconut and dry red chilies that imparts a mildly sweet and spicy taste to this dish. As a variation, this recipe gives a non-vegetarian twist to traditional Tondak and combines large sized prawns, starchy potatoes and several spices with fresh coconut. 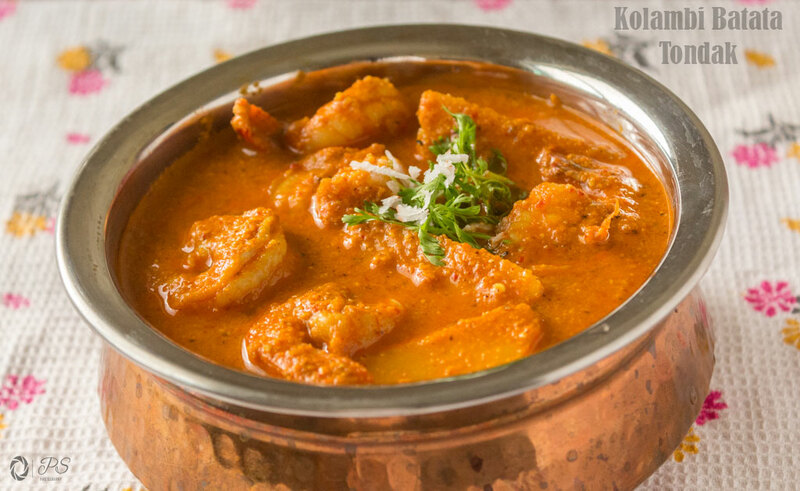 The resulting dish is an interesting medley of flavors of sweet, spicy and tangy gravy with soft and succulent prawns. Heat a pan. We will start dry roasting the ingredients. We must roast ingredients only until we get a waft of pleasant aroma (do not brown it). Roast dry red chilies, whole Coriander Seeds, fennel seeds, poppy seeds, cinnamon stick, star anise, black peppercorn, Teppal, cloves. Dry roast coconut for couple of mins. Finally dry roast onions for couple of mins. Allow the roasted ingredients to cool down before we grind it into a fine and thick paste. We have used 1-1 and ½ cup water while grinding. Heat 3 tbsp. oil in a pan. Add masala paste, turmeric powder and 1 tsp salt. Bhunao the masala paste. Bhunao masala for 6-7 mins. Now add Tamarind pulp, potatoes, salt to taste and 1 and ½ cup water and mix. Cook on medium heat until gravy begins to simmer. Add 1 cup of water and lower the heat and cook covered until potatoes are done. Prawns get cooked in 4-5 mins. Turn off the heat and keep the gravy covered until serving time. 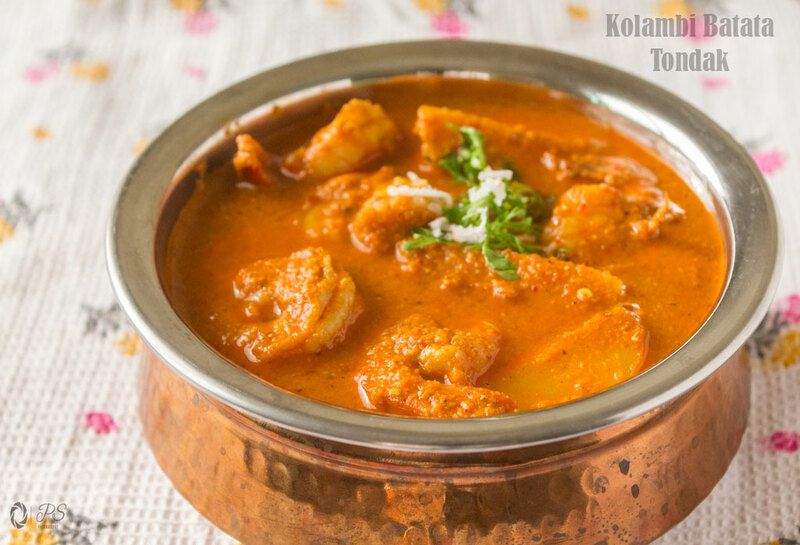 Goan Konkani delicacy: Kolambi Batata Tondak can be relished with steamed rice. Thanks Supriya for stopping by ! Glad to know that you like our recipe , and I too like the south Indian food. Please keep visiting , and let me know your feedbacks 🙂 Happy reading !